Problem in salivary glands or in their ducts can lead to swelling in the face, dry mouth (xerostomia), foul taste in the mouth, fever, pain in the face or mouth and difficulty in opening mouth. Alivary stones also called as sialoliths, it is the most common cause of swollen salivary glands. Stones are formed from salts present in the saliva. They are frequently formed in people with dehydration or due to drugs causing decrease in saliva formation. Stones block the duct that drains the gland leading to their painful swelling. Due to obstruction, stagnant saliva may further become infected adding to more problems. Pain and swelling becomes worse after eating and food stimulates salivary secretion which further goes to the blocked duct. It is a more common problem seen in adults. Infection of the salivary glands usually parotids occur when the ducts are blocked. It is also called as sialadenitis. Painful lump in the gland and foul-tasting pus drains into the mouth. These bacterial infections often affect the parotid gland and commonly found in older adults with salivary stones. Dehydration and malnutrition are important risks leading to bacterial infection. Sometimes it is also found in babies during the first few weeks after life. Severe pain and high fever accompanies the infection and if left untreated it can lead to abscess formation. Bacteria that are normally present in the mouth are the major cause of gland infection e.g. staph bacteria. Bacterial infections usually cause one sided salivary gland swelling. There are various viral infections that can lead to salivary glands swelling. They include mumps, flu, Epstein-Barr virus, cytomegalovirus, and the human immunodeficiency virus. Bilateral swelling of both parotid glands gives “chipmunk cheek appearance”. 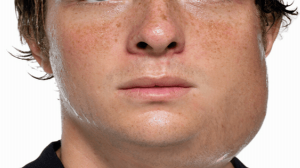 Mumps is the most common cause of salivary swelling occurring in 30 to 40% cases. Other conditions that can lead to swelling include Sjogren syndrome, diabetes mellitus, tumors, cysts, sarcodiosis etc. Diagnosis depends on the medical history, physical examination and relationship of pain to mealtimes. A biopsy may be required to rule out various causes of gland swelling particularly autoimmune disorders and tumors. A dental x-ray can help in locating the point of obstruction. If a diagnosis is unclear then CT, ultrasonography and sialography are helpful. Treatment of salivary gland disorders depends upon the cause. For stones or blockage, treatment usually starts with warm compresses, massaging the glands, pain relief, triggering the salivary flow by taking candies of lemon juice and taking excess fluids. If these simple measures don’t help then removal of stones by manual compressions or surgery may be required. Surgery is usually required for tumours. Radiation and chemotherapy are also required in few tumours. Salivary gland infections require treatment with antibiotics. Medications are also required for dry mouth. Taking good care of teeth is important in preventing salivary gland disorders. Non cancerous mass or growth that doesn’t cause any symptoms should be best treated conservatively.